Prayer should take up a large part of a Christian’s life. The Apostle Paul wrote that we should pray without ceasing and give thanks for all things (Colossians 3:17, 1 Thess 5:17-18 and Psalm 86:12). What do we prayer for? How encompassing is the list of things to pray for? Do you pray for a meeting you have on Monday, what clothes to wear, or a friend’s health? Do you pray that you can open the Scriptures and teach them to someone today? Do you pray and give thanks for your meals? There’s certainly a lot we could pray about if we pray. Some things have eternal value and some things do not. Some things we ought to pray for on a regular basis. Jesus gave us a model prayer – what we call the Lord’s Prayer – and it is found in Matthew 6:9-13. Let’s take a brief look at the first verse using the English Standard Version. This is really important because Jesus gave it to us as a model for prayer. If you’re used to the Lord’s Prayer and you just whip through it, you’ll miss a couple of vital requests right in the first part – well before asking for our daily bread. The first one is “hallowed be your name”. The second one is praying that His kingdom come like it exists in heaven. The third request is that His will be done on earth as it is in heaven. Frankly, if we comprehend the gravity of just Matthew 6:9-10 our lives – and our prayers – would be so much different. We’ll just explore “hallowed be your name” for now. If you grew up reciting the Lord’s Prayer, you may have just blown through it and not thought about what is being said here. When we pray we need to recognize who God is – the Creator of all things, the King of all things, He is holy, He is the one true God. He is the Father of all things and the Father of Jesus the Christ, His Son. Not only is God is the Father of Israel (Deuteronomy 32:6), His name is above all names. Yahweh, or YHWH, is the most common name used for God in the Old Testament. The vowels are removed because His name is so holy you cannot speak it, you cannot write it. We don’t even know if Yahweh is the correct spelling because all we know for sure are YHWH. Jewish friends still write G-d, leaving the vowel out so as to not write His holy and sacred name. Some won’t even destroy a piece of paper on which His name is written in Hebrew. He told Moses to tell the people that he is I AM. He is eternal. He was, He is and He will always be. How holy and sacred is God to you? It is imperative that we recognize God for who He is. He is not a vapor or a goofball who friends you on your phone. He is the Creator before whom we shall all give an account of our lives. He is the Father who sent His Son to be the perfect sacrifice for your sin and gave His Son the power to overcome death. We must acknowledge God in our prayers as our Father in heaven and acknowledge that He is holy. The second part of this verse carries the theme forward: everyone needs to recognize God for who He is. “Hallowed” is used in most English translations and a quick on-the-fly rendering is “holy is your name”. 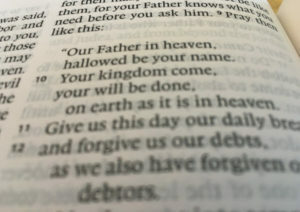 But, the word translated “hallowed” is the Greek verb hagiazo making this phrase a request, a petition — not just a statement saying God’s name is holy. Another way of reading this phrase is “Our Father in heaven, may your name be kept holy.” Wait! Can you imagine a world in which God’s name and Jesus’ name are revered and not used in curses or laughed at? We’re pretty numb to the fact that God’s name is used in cursing all around us – on television, movies and elsewhere. Imagine if folks realized that they were blaspheming God’s name. What a different world we’d live in! Script writers would have to dig for more words to write. Anger would have to be expressed in a different way – or not at all. People would have to increase their vocabulary and use exclamations that don’t use the Lord’s name in vain. God’s name is holy and we are to pray that all people everywhere will revere His name and know the gravity of His holiness. He is the one and true God, Creator, ruler of the Universe and Jesus Christ is His Son and King. One day every knee will bow and every tongue will confess Jesus Christ is Lord (Isaiah 45:23, Romans 14:11, Philippians 2:11). Jesus Christ bore the wrath poured out by God the Father for our sin. He did it for you. That fact is yours to accept or reject. We pray that you accept it. Perhaps you have clicked on this site because you want to know more about what it means to know God and follow Christ. You will find material here to answer many of your questions—but we would love to talk with you anytime.